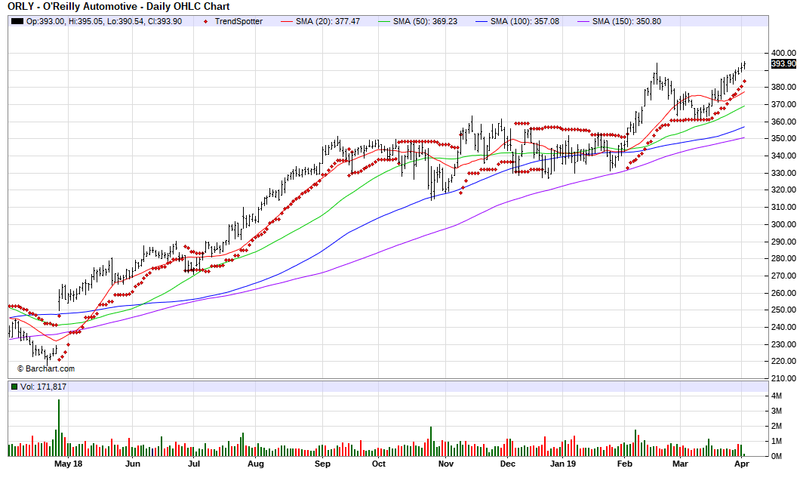 The Barchart Chart of the Day belongs to the auto parts company O'Reilly Automotive (ORLY). I found the stock by sorting Barchart's New All Time Highlist first by the most frequent number of new highs in the last month then used the Flipchart feature to review the charts for consistent price appreciation over the past year. Since the Trend Spotter signaled a buy on 2/5 the stock gained 10.19%. O'Reilly Automotive, Inc. is one of the largest specialty retailers of automotive aftermarket parts, tools, supplies, equipment, and accessories in the United States, serving both professional service providers and do-it-yourself customers. O'Reilly Automotive are the dominant auto parts retailer in all of market areas. O'Reilly Automotive provides new and remanufactured automotive hard parts, such as alternators, starters, fuel pumps, water pumps, brake system components, batteries, belts, hoses, temperature control, chassis parts, driveline parts and engine parts; maintenance items, such as oil, antifreeze, fluids, filters, wiper blades, lighting, engine additives and appearance products; and accessories, such as floor mats, seat covers and truck accessories.